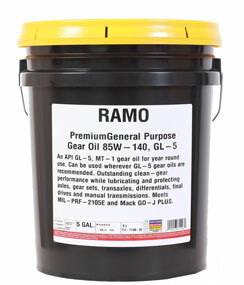 RAMO Multipurpose High Performance GL-5 Gear Oil is high performance gear oil that meet the latest specifications for today's high performance automobiles, trucks and industrial applications. This oil is manufactured to meet extreme pressure (EP) applications and is designed to resist oxidation and allow for longer oil change intervals. This gear oil is recommended for use in differentials, including most limited slip differentials, transmissions, transfer cases, planetary and industrial gear boxes where extreme pressure lubricants are required.